You must complete a ritual for the Skaal in order to gain their trust. 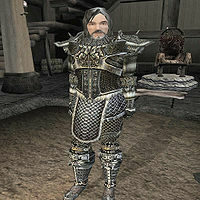 Talk to Tharsten Heart-Fang in the Greathall in Skaal Village with the warrior skull in your inventory. Speak to Korst Wind-Eye in the Shaman's Hut to be told about the Ritual of the Gifts. Perform The Ritual of Water. Perform The Ritual of Earth. Perform The Ritual of Beasts. Perform The Ritual of Trees. Perform The Ritual of the Sun. Perform The Ritual of the Winds. Return to Tharsten in the Greathall to complete the ritual. Tharsten has many quests for you. Talk to Tharsten Heart-Fang in the Greathall of Skaal Village and mention your business here, and if you have the Skaal warrior skull, Tharsten will accept it with some gratitude and welcome you to the village, for the moment at least. Tharsten goes on for a bit about how the Imperials are corrupting the land and eventually about how to restore the power of the Skaal. Tharsten tells you to speak with Korst Wind-Eye in the Shaman's Hut for more information. If your partner in the previous The Frostmoth Smugglers quest died, you may be attacked by the other warrior once you return to the fort, and thus be prevented from getting the skull. The Shaman's Hut is just west of the Greathall and Korst is just inside. 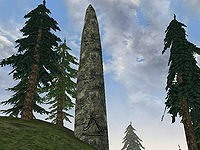 Mention that you are looking to restore the power of the Skaal and he'll tell you that you must find the six Standing Stones somewhere on Solstheim and complete a ritual at each one. Once this Ritual of the Gifts is completed, the Oneness should be restored to the Skaal. The Oneness is explained to you as the balance or harmony of all things in the world given by the All-Maker. This balance has been upset, in part by the presence of the Imperials, and thus the power of the Skaal has decreased. Perform the Ritual of the Sun here. Once you have completed all six portions of the Ritual of the Gifts, you will receive a journal entry to return to Heart-Fang in the Greathall of the Skaal Village. Tharsten Heart-Fang will reward you with the Mace of Aevar Stone-Singer and tell you that you must still prove your wisdom to the Skaal. 10 Tharsten Heart-Fang seemed pleased with my gift of the Skaal skull, and was willing to allow me to remain with the Skaal for a time. 20 Heart-Fang is clearly angry with the Imperials' presence on the island. He believes that they have no respect for the land or the creatures on it. He also believes that they are responsible for the dwindling power of the Skaal's powerful nature magic. He spoke of how the Imperials have disrupted the Oneness of the land, the balance that lies in all living things. 30 Heart-Fang tells me that I will need to atone for the mistakes of the Imperials. He wishes for me to perform a ceremony to restore the Skaal's original power. I should speak with Korst Wind-Eye to learn more about this. Wind-Eye is in the Shaman's Hut. 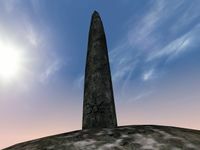 40 Wind-Eye tells me that there are six Standing Stones on the island of Solstheim, each representing one of the six gifts of the All-Maker. In order for me to perform the ceremony that Heart-Fang wishes, I will need to visit each of these stones and perform a ritual. 50 Wind-Eye has given me a scroll that shows the location of each of the Standing Stones, as well as a book that gives the history of the Skaal's beliefs. I should investigate these Stones if I am to restore the power of the Skaal. 60 I have completed the Gift of Water ritual. 62 I have completed the Gift of Earth ritual. 64 I have completed the Gift of Trees ritual. 66 I have completed the Gift of Beasts ritual. 68 I have completed the Gift of the Sun ritual. 70 I have completed the Gift of Winds ritual. 80 I have completed all the six rituals necessary, and should return to Heart-Fang. 100 Finishes quest Heart-Fang was pleased with my efforts in performing the six rituals. He has rewarded me with the Mace of Aevar Stonesinger, a prized Skaal weapon. Heart-Fang was reluctant to give me the weapon, as I am still an outsider to him. Still, tradition dictates that I be given the magnificent mace.